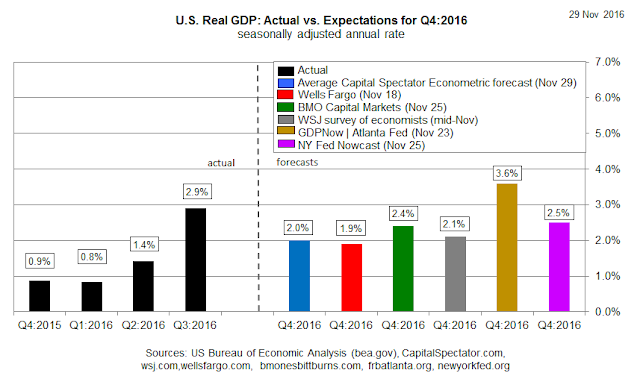 Home > economy > Is US GDP Trending Down in 4Q? Is US GDP Trending Down in 4Q? The rebound in US economic growth in the third quarter is looking vulnerable in Q4, according to recent estimates from several sources. If the projections are accurate, the 2.9% pace in Q3 (the highest rate in two years) is headed towards 2.0%. That’s still an improvement over the sluggish pace in the previous three quarters (Q4:2015 through Q2:2016), but the latest estimates for Q4 point to a softer macro trend in this year’s final three months. The average Q4 prediction in The Wall Street Journal’s October survey of economists is 2.1%, well below Q3’s 2.9% advance (all GDP changes quoted as real seasonally adjusted annual rates). The forecast, if accurate, will deliver the second-fastest quarterly increase in more than two years. Nonetheless, economists have turned relatively cautious in recent weeks. The Atlanta Fed’s GDPNow model is an exception, based on the Nov. 23 estimate. 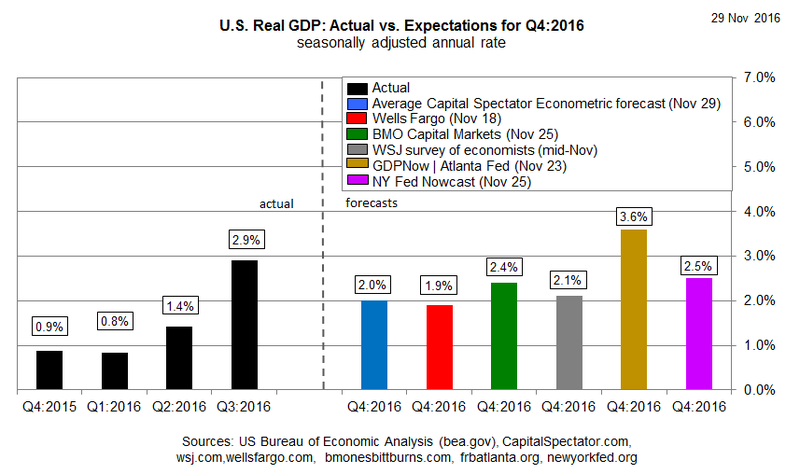 The Fed bank’s nowcast is looking for a 3.6% increase in Q4 GDP—a solid improvement over Q3’s 2.9%. But that rosy outlook is an outlier at the moment. Softer estimates from other sources suggest that the Fed bank will trim its nowcast in tomorrow’s update (Nov. 30) that follows the release of personal income and spending data for Oct. The Trump-election factor, however, continues to convince some analysts that any Q4 slowdown will be temporary. The OECD’s new economic forecast, for instance, sees firmer growth next year for the US and the global economy. “In the aftermath of the US elections, there is widespread expectation of a significant change in direction for macroeconomic policy,” the Paris-based Organization for Economic Cooperation and Development advised yesterday. The outlook for new a stimulus program is on track to “raise calendar year US GDP growth by around 0.4 percentage points in 2017 and a little over 0.8 percentage points in 2018,” the organization advised. With a Republican president, the party has always been glad to boost public spending and relax debt limits, as it was under Presidents Ronald Reagan and George W Bush. Thus, Trump will be able to implement the Keynesian fiscal stimulus that Obama often proposed but was unable to deliver. Today’s revised GDP numbers for Q3 GDP are expected provide a degree of support for thinking positively. Econoday.com’s consensus forecast calls for a slightly faster growth rate of 3.1% vs. the 2.9% pace in the previous estimate for Q3. The question is whether Q4 will provide any comfort for an upbeat forecast in 2017? At the moment, there’s a bit more skepticism that the Q3 rebound has legs.